Indeeco’s ESI series flanged immersion heaters offer the simplest installation available with our unique enclosure design. 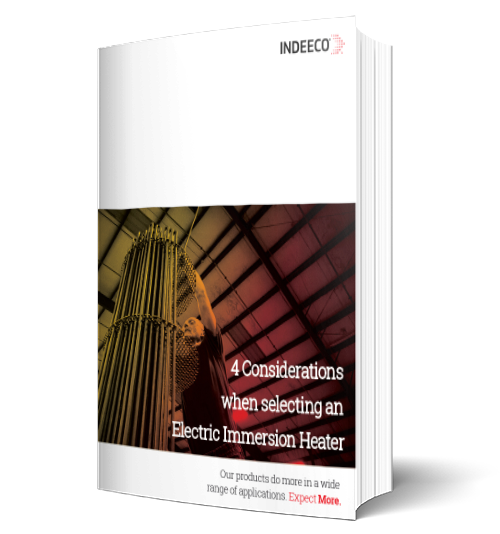 Each flanged immersion heater is uniquely designed for its specific application. Our sales and engineering staff will work closely with you to understand your application and offer a solution that is engineered specifically for your needs. Need it quick? Take advantage of our FastTrack shipping program which is available on most heater designs. Removable and rotatable general purpose enclosure for easy pairing of incoming power feed. Weatherproof enclosure offers multiple flat surfaces for the addition of connection hubs. Weatherproof enclosures are constructed of stainless steel providing corrosion resistance. ANSI B16.5 150# or 300# flange 2" up to 36"
Provided when the heater is operating above 500° F to allow for cooler operation of the terminal box. This allows the heating elements to be sealed with epoxy or RTV and for the customer to provide incoming wire with a much lower insulation temperature rating. Bulb and capillary pilot duty or load carrying thermostats can be provided to control the heater or to provide over-temperature protection. The thermostat bulb can be installed in a thermowell to sense process or element sheath temperature. Type J or K thermocouples can be provided to monitor the process or element sheath temperatures. Thermocouples provided with a ceramic wafer head and screw terminals for ease of wiring. Alternate type E or T available but not FastTrack eligible. Provides means for heat to exhaust from the terminal box to minimize heat buildup. Support rods can be added to high flow heaters to keep the element support spacers in place.